One of the more creative ways to remember someone who means a great deal to you is by having an Irish claddagh tattoo on your upper arm. 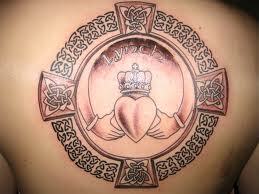 The Irish claddagh tattoo is a unique design that consists of two hands holding a heart that’s topped by a crown. The hearts of the claddagh stand for love; and the hands for friendship. The crown represents loyalty. A lasting symbol of love and friendship, the claddagh tattoo is perfect if you don’t want to inscribe your friend’s name to recall sweet memories of your relationship. You can make your Irish claddagh tattoo even more elaborate by inking a colored gem into the crown. The claddagh mothers pendant is an Irish claddagh tattoo that you can circle around your arm if you’re attracted to the design. Traditionally, the claddagh mothers pendant is a row made up of heart shapes with colored stones that reflect the birth month of each child. Irish knots and crosses are excellent additions to the core claddagh symbol to make your Irish claddagh tattoo stand out. You could even pair the Irish claddagh design with a shamrock for originality. Or you could be adventurous and ink several different symbols with your Irish claddah tattoo to make it quirky and special. The claddagh has been an Irish symbol for over 300 years. Named after a village in Ireland, the claddagh is credited to the Irish fisherman, Richard Joyce, who was once kidnapped by Barbary pirates and sold to a goldsmith. As an apprentice, Joyce designed the claddagh ring in memory of his true love, left behind on the shores of Galway, in Ireland. When released from servitude, Joyce returned to Galway to find his bride had waited patiently for his return. The exchange of the Irish claddagh ring cemented their wedding. The Irish claddagh tattoo traces its origin to this story. An Irish claddagh tattoo remains the ultimate symbol of love, loyalty and friendship to this day. You can commemorate any aspect of your relationship with your significant other by inscribing a claddagh tattoo. This uniquely Irish tattoo design is ideal for celebrating your lasting union. It retains the spirit of the triumph of virtue and is a particularly poignant symbol to cherish.